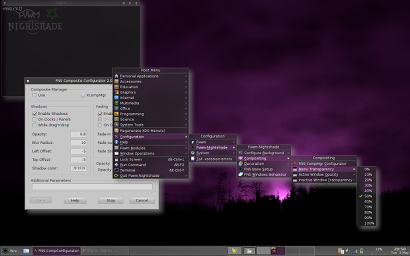 with default theme PitchBlack, a dark violet and plain theme and compositing. with Tribal theme, held in green/black tones with yellow font collors and tribal signs as buttons. 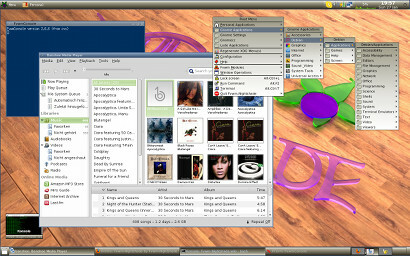 with CrystalBall theme, a milky Mac OSX theme with white, grey and blue tones. with Clean, a simple vector theme with blue/gray color gradients for title bar and Fvwm modules. Welcome to Fvwm-Nightshade! This project aims to be a lightweight but feature rich and good looking configuration of Fvwm. It contains many useful things to make work and life easier with a flavour of a modern desktop. But it can be configure by your own. 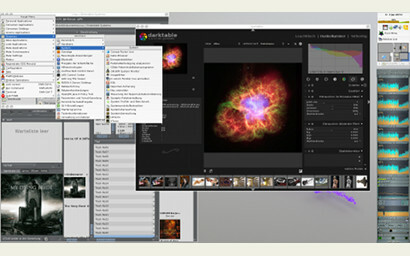 It is good documented and shows you what is possible with this powerful window manager. After two long years I've finished FNS for the upcoming version 0.8. Now Beta stage is started. Many eye candy themes/decors changable on the fly without restart. Localization support for German, French, Spanish and Russian. Graphical config tools for different settings. Also the new website is available with many many new and updated information. 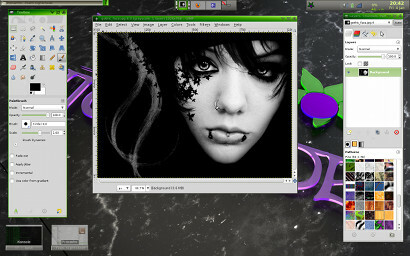 Currently Fvwm-Nightshade Beta is downloadable over Master branch. Check it out if you like what you see!